The North American AJ Savage (redesignated A-2 Savage in 1962 with the introduction of the joint aircraft designation system) was a carrier-based bomber aircraft built for the United States Navy by North American Aviation. The original contract was awarded in 1946, and the plane entered service in 1949. The AJ Savage was a large composite-powered carrier-borne Attack Bomber designed to deliver nuclear ordnance. It also performed photo reconnaissance duties and later on was used as an aerial refuelling platform. The North American AJ-1/2 and AJ-1/2P Savage aircraft were in a number of USN Heavy Attack Composite squadrons from 1948-1956, as well as in several Photographic Reconnaissance squadrons. The Heavy Attack versions were the first nuclear bomb carrying bombers able to be launched from and recovered on aircraft carriers. The date of its inception was a time where the US Navy was faced with procuring the nacent jet engine, while still having to rely upon the simple yet well proven reciprocating engine. Jets at this time were unreliabe and used large quantities of fuel, however, once they were developed, they produced performance that no piston engine could ever provide. A compromise was made to include in the Savage two Pratt & Whitney R-2800 piston engines and an Allison J33 turbojet in the rear fuselage. Interestingly, both engine types used the same fuel. The piston-turbojet arrangement was intended to give added power on take-off and extra dash speed while in combat. 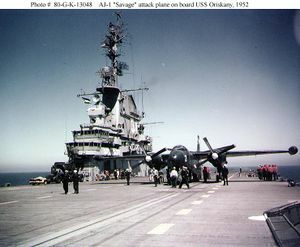 The first production Savage flew in May 1949, with the first carrier landing of the type taking place on the USS Coral Sea (CV-43) on 1950-08-31. Early model Savages (AJ-1) were converted to the air tanker role, with the bomb bay filled with all the necessary equipment, including hoses, fuel pumps, electric power drive, and the drogue. Additional fuel was provided in drop tanks. The AJ-2 first flew 1953-02-19 and had uprated engines and a taller vertical stabilizer and non-dihedral tailplane. The AJ-2P was the photographic reconnaissance version of the Savage. It carried photo-flash bombs for night missions, with most of the plane's 18 cameras being operated automatically. It was capable of night and low-level reconnaissance. The -2P also had additional fuel capacity. A-2B Savage s/n 130418 is on display at the National Museum of Naval Aviation at Naval Air Station Pensacola at Pensacola, Florida. XAJ-1 : Prototype, two aircraft built. AJ-2P : Photo-reconnaissance version of the AJ-2, with redesigned nose for cameras. AJ-1 Savage attack plane on the USS Oriskany (CV-34) flight deck. This page was last edited on 5 March 2007, at 09:15.